Finished Size: (including border) 8¼“ wide and 7¼” long. Needles: Size 6 (4 mm): 24” circular (cir). Adjust needle sizes if necessary to obtain the correct gauge. Notions: Markers (m); tapestry needle; Poly-Fil Polyester Fiberfill. 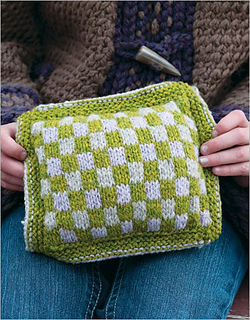 Gauge: 20 sts and 24 rows = 4” in checkerboard patt.